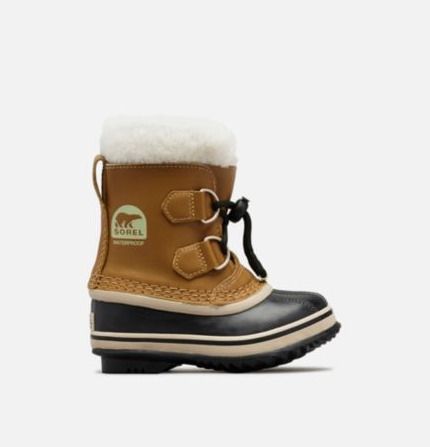 THE DETAILS This waterproof boot features a PU coated leather upper on a nimble, lightweight shell, making it great for keeping little feet warm and dry without weighing them down during long winter play. Best For: Heavy Snow THE CONSTRUCTION UPPER: Waterproof PU coated leather upper. Seam sealed waterproof construction. 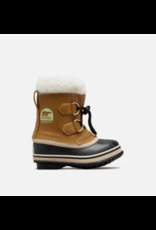 INSULATION: Removable 9mm washable recycled felt innerboot with Sherpa Pile snow cuff. MIDSOLE: 2.5 mm bonded felt frost plug. OUTSOLE: Handcrafted vulcanized rubber with herringbone outsole. SOREL rated: -40° Fahrenheit / -40° Celsius Shaft Height: 6 1/7 in. Heel Height: 6/7 in. Platform Height: 1/2 in. Measurements based on size 1. Imported.